The first ever supermarket in Watford on the Parade opposite the Odeon Cinema (which later became Top Rank) was FINE FARE. I think Fine Fare in recent times morphed into Key Markets possibly later on the International Stores got involved in ownership but I’m not sure as here in the West Country Key Markets and International were bought out by Gateway, later to become Somerfield or something like that. The first actual “self-service” shop that wasn’t a Supermarket as such were The Co Op just along from Fine Fare. They were near to Stan Pike Newsagent and Tobacconist and about the last shop before the unusually named Cakebread Robey who were a showroom for Fireplace and Fires. My parents bought an Esse Stove from them. The only shop with Coffee smells I remember were the place that sold coffee beans and roasted them on the premises. It was two doors along from Chef Corner Cafe which was opposite front of Odeon Cinema and I can’t remember what it was called. The first shop beyond Chef Corner was Woolcotts a sweet shop and tobacconist. I bought an Italian Coffee machine from the Coffee retailer in 1969 for just £11.0 I still have it to this day and it still works! Beyond the Coffee shop was a Toy Shop in the corner where my friend noted that you could buy 12 plastic toy pennies for the prices of One Shilling and Sixpence and we wondered what kind of a trick that was when a child could play with 12 real pennies and spend nothing! Anyhow I do remember that lovely coffee roasting smell drifting down past that Tudor fronted building where Radio Rentals were and on the first floor of which was The Cookery Nook – a favourite morning cafe for the more elderly population who loved it’s olde worlde charm. I’m sure I could think of much more but I don’t want to dominate this page as it may discourage others from posting up their wonderful memories. This page was added on 26/08/2009. Jacksons were the jewelers in the black and white building which was opposite the end of Clarendon Road. Garners the bakers were on the corner of the High Street and Mac Fish was just to the left of that. I think Hepworths the taylors may have been on the other corner. I also remember the smell from the coffee shop.It was situated just to the right from the picture. John A, I also went to La/Le Caprice in the early eighties.I think it had a small dance floor too.Always reminded of old Watford when I see some of the Carry On films with the Peace Memorial Hospital. Woolcotts Hight Class Confectioners as it was known in those days and also Saltas sweet shop next door to the shop that sold coffee beans and had a roasting machine in the window. My mum being Italian always bought a quarter of Dark Continental Roast once a week – the smell was like nothing else! My response is to J. Grout dated 1.5.17 relating to Graphic Photo’s North Watford. I don’t think anyone took this over following its closure, but I may be wrong. My former husband was a friend of the owner, whose name escapes me. Both were interested and involved in a camera club. We even bought his nearly new blue Renault 16 which was a lovely car and he allowed me to park in his car space at the back of the Waitrose supermarket which replaced the old Watford Odeon cinema. We were regular visitors to his shop. Does anyone remember ‘Graphic Photos’ 1, Odeon Parade, North Watford? Just wondered if the shop still exists in some form or other. 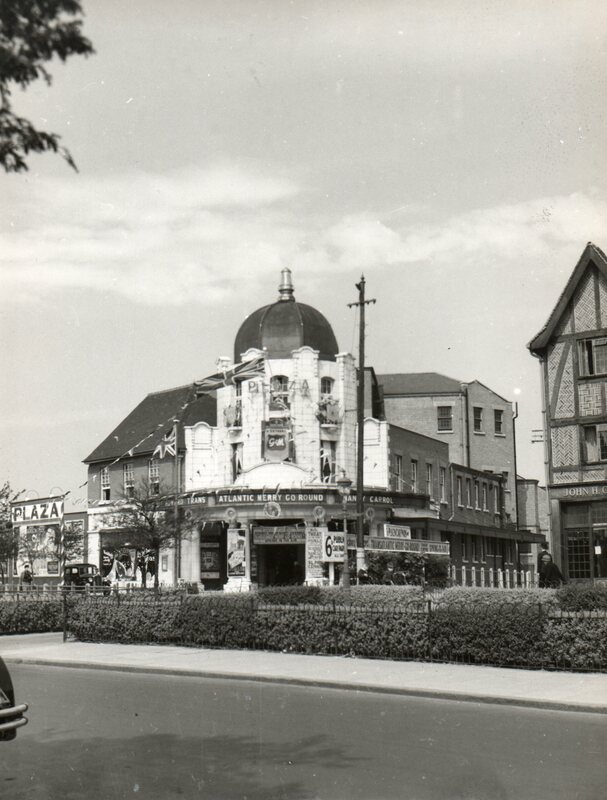 Does anyone remember ‘Graphic Photos’ 1, Odeon Parade, North Watford? Just wondered if the shop still exists in some forms or other. My mum.s side of the family lived in Watford for many generations having a house at 3 Duke Street. Her grandfather, John James, was a local magistrate and locally was quite well known. His son, Ronals Geoffrey Childs had a gentleman’s barber shop at 75 St Albans Road. I would be interested to hear any local memories of the family who lived at 8 Norfolk Avenue. With yesterdays sad death of Mohammed Ali I am reminded that he appeared at Caters Supermarket when I was a child. However the more I think about it the more unlikely it seems. Does anyone else remember this? Is my mind playing tricks on me (again!) or does anyone else have any recollections of any of the above? Born 1961. My first job (circa 1977-8) was shelf-filling in Caters supermarket under what at the time was Top Rank and then Bailey’s Night Club. The manager was a Mr O’Sullivan and he’d inflict Irish folk songs and Jim Reeves on us over the Tannoy as soon as the shop closed. What ever happened to Caters? Those memories are are wonderful I lived in Casiobridge road, mid 60’s -70 before that South Oxhey, I remember the coffee shop, the smell was fantastic, I used to go Top Rank on a Saturday morning, walk to Chater School, play down the park, thank you. The coffee shop was Importers, they had two shops on the High Street, one near St Mary’s church, near where Mobile Solutions is on Google Street View and the other on The Parade, near Chef’s Corner. Both shops produced wonderful roasting coffee aromas. I can still remember going in with my Dad for a quarter of Dark Continental, medium ground on Saturday mornings after music lessons at Watford School of Music when it was in Red Lion Yard. That was before it moved to Nascot Wood Road. No one has mentioned Joe Lyons Coffee House. The waitresses wore white, frilly caps. Mum would meet me and my sister from school and have a lovely tea there every Friday before heading off to “The Flicks”. Also ABC restaurant on the corner of Kings St. It was a good place to see Watford F.C. footballers. And the Black and White Coffe Bar next to the Midland Bank. I well remember, as a child my mother taking us shopping to Watford. At the time we lived in Elstree and this wouls have been in late 60s – very early 70s. We used to get the ‘green bus’ either 306 (?) and we knew when we were in Watford as soon as we smelt that delicous aroma of coffee..I also remember buying presents from Clements and the market. Both my parents came from Watford but by the time I was born they had moved out to Pitstone. I remember my many trips to Watford as a child during the 50s, wide eyed with wonder at all the shops. Clements and Cawdells offered visit to see Santa. The covered market was a favourite as I would always buy a small bunch of anemonies for my grandmother who lived in Upper Paddock Road, well I think I chose them and my great uncle who owned the stall probably gave them to me. Gibson sausages were always on my mum’s shopping list, just as well there were no domestic freezers at that time otherwise I think she might have bought out the butcher’s stock, and of course the wet fish monger where we would buy sprats. Driving into Watford past the town hall and the pond there used to be the swimming pool and as a child I was alway puzzled by the ‘Public Bath’ sign, I could never understand why people would have a bath in public, a child’s mind is so literal. My engagement and wedding rings were purchased from a jeweller in Watford high street, the name of which escapes me, but it was a beautiful black and white building. The families connected with Watford are Martindale being my father’s name and Parkins my mother. I believe my father’s maternal grandfather Joseph Smith was the owner/landlord of the Crystal Palace Beer House, 121 High Street Watford. I now live in East Sussex so have little opportunity to retrace childhood steps, although I intend to go again to my grandparent’s grave in the cemetary in Vicarage Road, so if by chance anyone reading this has knowledge of the Martindale/Parkins families I would be delighted to hear from them.